February 26, 2018 at 12:05a.m. 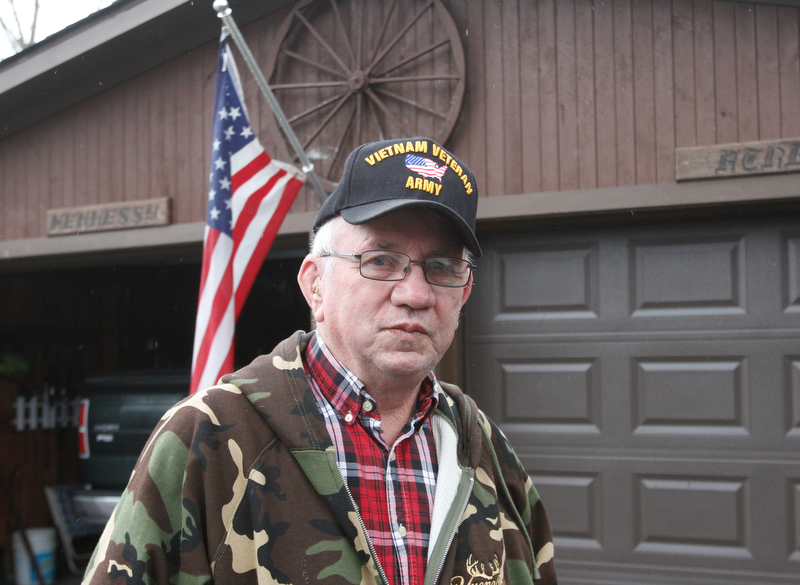 Photo by Robert K. Yosay | Jim Hennessy, who lives near two planned injection wells in Brookfield, is bothered by the noise of the drilling and trucks servicing their construction. Jim Hennessy built his log cabin-style house and garage on Merwin Chase Road 40 years ago. He and his wife raised a family there in the quiet neighborhood. Now, at all hours of the day and night, there is constant clamor and noise from construction of two injection wells just beyond his 12.5 acres, he said. It’s even worse for residents in Wyngate Manor, who live just a few hundred feet from the well site. While the noise is disruptive, residents on Merwin Chase and in Wyngate Manor say they are more concerned about the potential health hazards of the two injection wells being built by Highland Field Services, a Pittsburgh-based company. The company also has three more pending permits near its approved wells, just off state Route 7. Hennessy lives about 1,200 feet from the drilling site and can see the construction from the edge of his property. “It’s almost in the backyard of my neighbors. They have been calling and calling because of the noise back there,” he said. Highland was not available for comment late last week. Steve Irwin, a spokesman for the Ohio Department of Natural Resources, said the three additional permits remain pending; the department is reviewing the public comments that were submitted and the geography of the proposed site. This won’t be the first time Hennessy’s life has been disrupted from drilling. When another company drilled a well (now inactive) down the street from him around 1994, he said he had to pay $4,000 to fix problems with his water well. The distance from the entrance to Wyngate Manor and Merwin Chase Road is less than a mile, and the access road to the wells sits in between. All around the site, for-sale signs are seen in people’s yards. Hennessy said they worry property values will plummet once Highland begins drilling, and that the available property might also be bought for fracking or injection-well use. “The wells are within hundreds of yards of some of these homes, and people are concerned about the noise because they are chopping and grinding trees. But it’s nothing compared to what it will be when they start drilling,” said township Trustee Dan Suttles. Hennessy, along with other Brookfield residents, is organizing a trip to the statehouse and the ODNR building in Columbus to peacefully protest the injection wells. “I think everybody in Brookfield should get involved. It’s time we go to [ODNR] and show them we don’t want this in Brookfield. We are going to do a peaceful march; they have to see us with our signs out like that,” Hennessy said. About 20 people are signed up to go so far. Details have not been set yet. What especially concerns Hennessy and other nearby residents is the potential for earthquakes and water contamination, as some streams in the area run past the drilling site and empty into the Shenango River. “Those mobile homes [in Wyngate Manor] are sitting on slabs. Say we have an earthquake; it could do a lot of damage, just knocking them off the foundation over there. It could knock mine off its foundation, too,” Hennessy said. As a former fire chief, Suttles recognizes the risk of emergency responders being delayed by truck traffic that will take wastewater back and forth from the well site. ODNR said initially there will be about 25 trucks visiting the site per day, but the number could increase. “The concern is that there are around 300 homes in the park, and if any of them caught on fire, the fire department’s ability to get there would be blocked. I heard anywhere from 25 to 250 trucks will be servicing the wells,” Suttles said. The fire hall is less than a mile from the Wyngate Manor’s only access road, but if trucks are lined up to get in the well access road, firefighters could be blocked from accessing Wyngate Manor and other streets and parks on state Route 7. “Brookfield services Hartford to the north, we have an agreement that we offer [emergency] services to their community, and the trucks kind of block the route there so it would have to take several more minutes to get to the community in need,” Suttles added. The whole community could be affected by these wells, not just residents living in Wyngate Manor or on Merwin Chase Road, Hennessy said. “We’ve got to stop them somehow,” he said. Hubbard Councilwoman Lisha Pompili-Baumiller, D-3rd, said a couple of activists came to the Feb. 20 council meeting and explained that earthquakes from the injection wells could potentially affect Hubbard, and urged residents to contact Congress and ODNR to help their fight against the wells. The wastewater, or brine, won’t be coming only from fracking in Ohio and Pennsylvania, according to ODNR. Suttles said the opposition to the wells must be a community effort. “I surely don’t want to see it happen in our community. I’m willing to do what I have to do,” Suttles said. March 22, 2018 9:55 p.m.
March 23, 2017 9:55 p.m.
October 11, 2017 12:03 a.m.